Cotton seedling disease and seed rots are caused by several different species of fungi. Primary agents in North Carolina include Rhizoctonia solani (Soreshin), Pythium spp. (Root Rot), Fusarium spp., Thielaviopsis basicola (Black Root Rot), and Phoma exigua (Ascochyta gossypii). These pathogens are found everywhere cotton is grown, and colonize weak cotton plants. Figure 1. 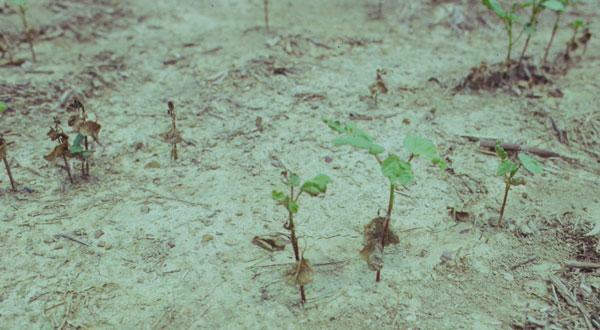 A poor stand of cotton seedlings caused by post-emergence damping-off fungi. Plants are more prone to infections by pathogens when stressed by an inhospitable environment, and environmental factors are very important in influencing the development of seedling diseases. Seedling disease occurs more frequently under cool, wet conditions and more prevalent on sandy, low-organic-matter soils. Other factors, such as planting too deep, poor seed bed conditions, compacted soil, nematode or insect infestations, and misapplication of soil-applied herbicides, may increase the problem. Additionally, seedling diseases tend to be more severe in reduced tillage situations and when beds are absent. Planting on beds elevates the seed allowing for more rapid emergence and improved water drainage, especially after heavy rains. Plants are also more prone to attack by pathogens when insects or nematodes cause damage to the root and crown of the plant. Damage from thrips in particular can delay seedling development and enhance damping-off diseases caused by various fungi. 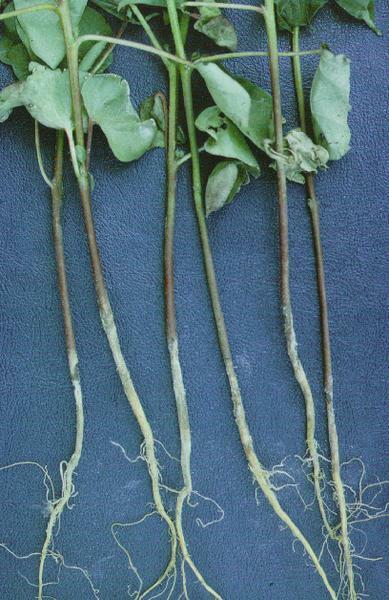 Rhizoctonia solani invades at soil level from time seedling emerges until growth around 6 inches after which stem becomes woody and infection is less likely to occur unless injured . Damage to the hypocotyl, called “soreshin” (Figure 2), is derived from sunken reddish-brown lesion which girdles the hypocotyl causing the seedlings to collapse. Surviving seedlings may show stunted growth. Pythium zoospores actively move in water. Commonly found in soils that are poorly drained or have been heavily saturated with water for several days. This pathogen causes seed rot and pre- and post-emergence damping off. Water soaked lesions appear and cause seedlings to collapse. Fusarium species survive indefinitely in the soil as fungal overwintering structures, and colonize weak, damaged tissues. Infections by Fusarium species results in stunted growth and failure to thrive. Some strains will only display symptoms, usually nematode galling on lateral roots, when also infected with root knot nematode. Thielaviopsis basicola infects seedlings at the epidermis and root cortex. Infected seedlings display a thinner dark brown to black discolored taproot. The pathogen leads to a loss of mycorrhizal symbionts and rotting of the cortex tissue. Thielaviopsis basicola rarely kills seedlings but does lead to stunted growth. As the plant matures new lateral roots and cortical cells develop and the taproot expands, shedding the dead, blackened cortical cells. Phoma exigua (syn. Ascochyta gossypii) develops in periods of cold, wet weather and infects the main stem at a node (Figure 3). Cotyledons prematurely turn brown and die. Below wilted leaves Phoma can create a black canker. Streaks found in the stem don’t usually extend to the roots like they do with infections by Fusarium species . Figure 2. Sore shin on cotton seedlings. Figure 3. Cotton seedling death caused by Phoma exigua. Although seedling diseases can be caused by numerous pathogens, these pathogens are most severe when seedlings are slow to emerge. Cool, wet climates increase the susceptibility of cotton to these pathogens. Rhizoctonia solani hyphae emerge and produce mycelium. The mycelia land on plant surfaces and secrete necessary enzymes to initiate invasion into host. Necrosis and sclerotia form in and around infected tissue. The pathogen is dispersed as sclerotia and can travel by wind, water, or soil movement. Rhizoctonia solani overwinters in plant debris, soil or host as sclerotia. Pythium infects host tissue through an encysted zoospore germ tube and overwinter as an oospore. Disease becomes more prevalent in cold, wet weather. Fusarium spores begin to germinate in the presence of developing roots and root exudates. Pathogen enters through direct penetration or wounds and spreads through seedling by microconidia in the xylem. Microconidia clog the xylem tissue and prevent water and nutrients from traveling to the rest of the plant. Dead plants return spores to the soil and move through irrigation water. Chlamydospores can survive in soil and plant residues for years. Thielaviopsis basicola overwinter as chlamydospores which can survive in soil for many years. Spores begin to germinate when root exudates are detected and soil conditions are favorable. Thielaviopsis basicola development is most severe during cool, wet weather. Phoma exigua is most severe when night temperatures fall between 50 - 60°F. The pathogen begins to attack seedlings from the time they emerge until they are about six inches tall. After the plant stems becomes woody further infection rarely occurs. 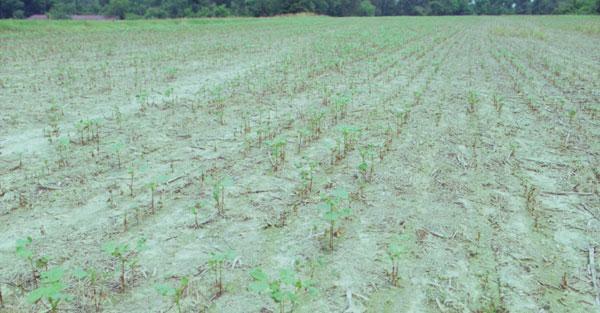 Cotton seedling disease management is based on preventative rather than remedial treatments. Rapid seed germination and establishment is beneficial to avoiding losses by getting seedlings to a resistant stage sooner. Poor quality seed with low germination potential and planting in cool, wet conditions should be avoided. All cotton seed offered for sale in North Carolina are treated with fungicides, and several seed treatment combinations are available (Table 2). Systemic fungicides provide temporary protection (about 5 weeks from planting) from certain types of pre-emergence and post-emergence damping-off. In addition to fungicide treatments, some newer products now also offer nematicide and insecticide treatments on the seed, though the efficacy of these to prevent seedling disease is not yet established. In most years, seed treatment fungicides are sufficient for controlling seedling disease, unless the quality of the seed is low or weather conditions are unfavorable for germination. Low or no-till cotton may increase the frequency and severity of seedling diseases since reduced tillage preserves inoculum that overwinters in crop debris. When planting in reduced tillage situations, using an in-furrow fungicide should be considered. Planting in raised beds can help control seedling disease by improving soil drainage. Rotating crops should also be considered to help prevent the buildup of cotton seedling diseases. These materials are generally used in combinations. For specific fungicide recommendations and formulations refer to the North Carolina Agricultural Chemicals Manual. Table 2. Seed treatment fungicides for control of seedling diseases. *List of seed treatments is not exhaustive, and several are available from different companies. **Little information on the efficacy of these biological pesticides is available.